Metallic Jumbo Pennant Strings, Super Bright Metallic material in a Jumbo 12" x 18" V-Shape 60' pennant string. Each string is 60 feet in total length. 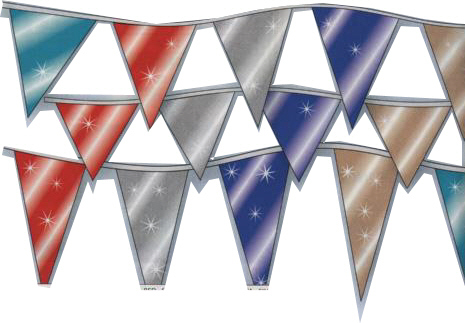 You will have 24, 12" x 18" v-shape pennants per string with 4 1/2 feet of tie ends to wrap around the poles. Choose your colors from the box above. If your special color combination is not listed in the drop down box then choose "custom" and enter your choice of colors in the "Custom Colors Text Box"